It is now time to get the first of the Freedom hives ready to try and attract some bees. Spring is late this year but I want to get some up in the trees ready for any scout bees to inspect. The hive needs to be made attractive to the bees. I do this by rubbing propolis and natural beeswax on the inside walls. This takes away any new timber smells and makes it smell of bee. Picture shows a ball of propolis which I rub onto the spales before inserting them. 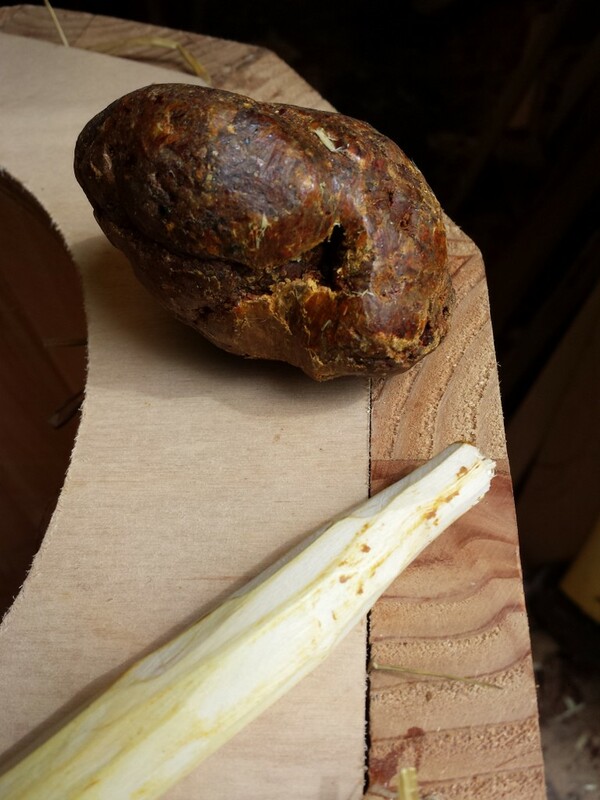 The spales are whittled from hazel stems. I use lengths the width of my finger and shape them so that the are oval in section. they then spring into holes drilled about 20cm below the top edge. The bees will build through them and it will support the comb if the top is opened. The top board is rubbed with more wax before some “welcome ” comb is fixed using hazel “nails”.This comb is old comb that I saved from another hive. When the top is put on, I put it so that the comb is perpendicular to the hazel spales. 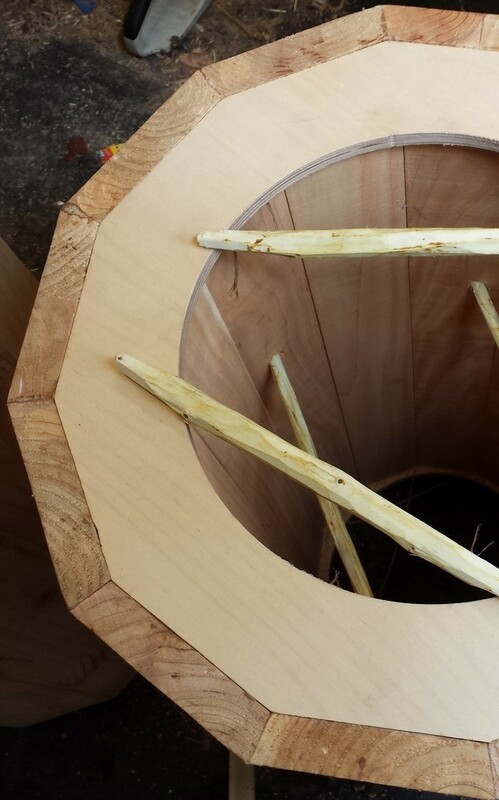 The top was fixed and covered with some wool insulation before adding a waterproof membrane. Finally I put some lemon grass oil on a cotton bud and dab the inside of a hole, which hopefully should attract a scout. 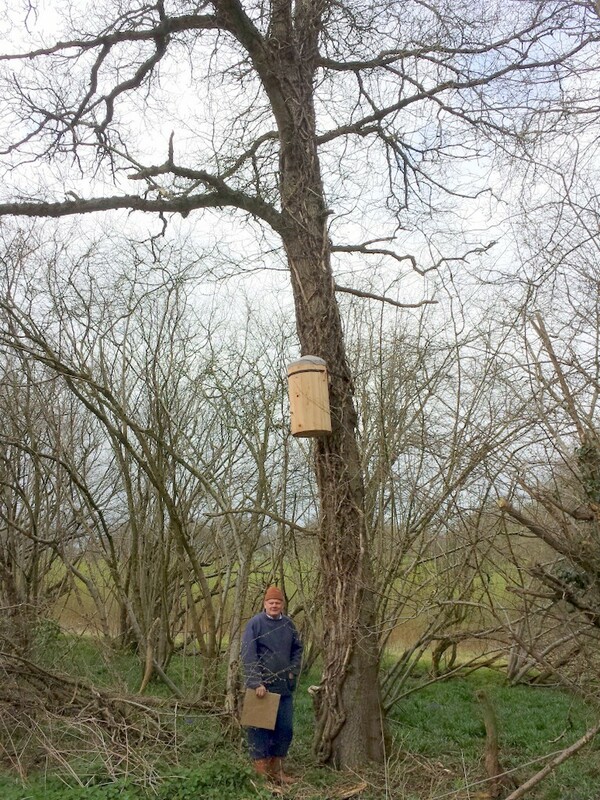 Below is John Haverson with one that we hoisted into an oak tree about 3m above the ground. I have some land in a rural location in Lancashire. I have planted quite a few trees and I have natural hedging and lots of willow. I have areas set aside for bees but would much prefer the hollow tree idea as I am interested in helping the bee and not harvesting. Is there anyone up here who would be interestedin advising helping? Thank you. Next Next post: Bee Kind Hives in the news!